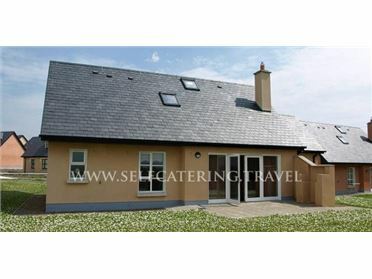 Arnestown Country House is a semi-detached cottage near the village of Wellingtonbridge in County Wexford. The cottage sleeps six people in three double bedrooms, one of which has an en-suite shower room. There is also a shower room, a kitchen with a dining area and a solid fuel stove and a sitting room with a solid fuel stove. Outside there is ample off road parking and a lawned garden with a patio and furniture. Arnestown Country House offers a fantastic starting point for exploring the sunny south east of Ireland. The small village of Wellingtonbridge is situated in the Sunny South East of County Wexford. Located halfway between the bustling towns of New Ross and Wexford, Wellingtonbridge is home to an historic railway station which was once an important location for the loading of sugar beet. Wellingtonbridge offers an excellent central location for touring the South East with Rosslare ferry harbour only a half hour drive away. Attractions include endless sandy beaches at Cullenstown and Bannow, perfect for family days out and romantic strolls. Oil central heating with solid fuel stoves. Electric oven and gas hob, microwave, fridge/freezer, washing machine, TV with Saorview, DVD, WiFi, selection of books, games and DVDs. Fuel, power and starter pack for stove inc. in rent. Bed linen and towels inc. in rent. Ample off road parking. Lawned garden and patio with furniture. Sorry, no pets and no smoking. Shop and pub 2.6 miles. .